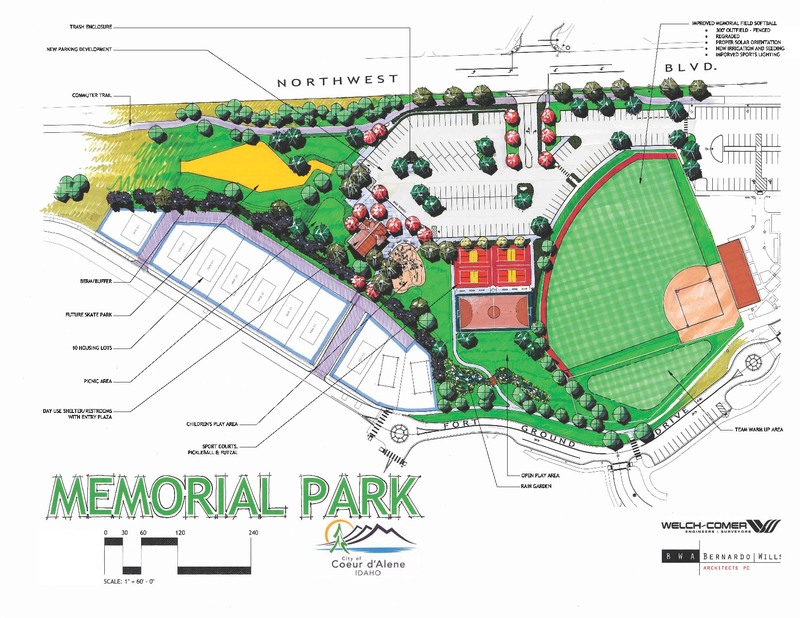 The Memorial Park project includes demolition of the existing Memorial Softball Field, skate park and alley access, and constructing a new Memorial Softball Field re-oriented in a more favorable playing condition, an expanded parking lot with a signalized intersection at Garden Ave and NW Boulevard, futsal and pickle ball courts, playground, restroom, picnic shelter and landscaped park areas including open green space and picnic areas. This improvement project is part of the Four Corners Master Plan, a vision that includes a two-mile stretch involving about 40 acres of land from Independence Point to near Riverstone. Concepts from the original master plan visioning process have changed based on community feedback, review by the Coeur d'Alene Parks & Recreation Commission, ignite CDA, and the City Council. Bid Opening:10 a.m. June 30, 2017 at Mayor’s Office, City Hall, 710 E.Mullan Ave.